Music at Trinity Church is inextricably woven into the elegance of the liturgy. On major feast days, brass and timpani, strings, woodwinds or handbells often augment the majestic pipe organ. 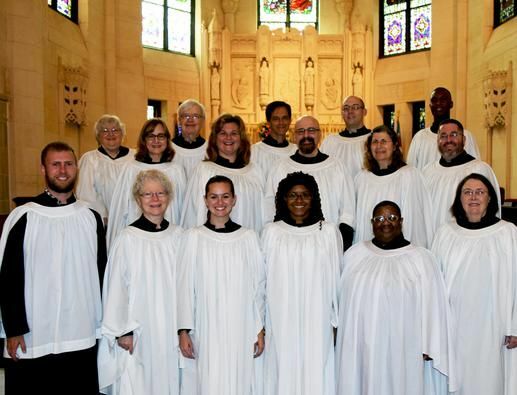 Trinity Choir, an ensemble of volunteers and staff singers, provides the service music and anthems for the Sunday 10:30 am Choral Eucharist, as well as for Choral Evensong, Compline and special feast days. Trinity Choir is open to all with some previous choral experience who enjoy singing fine music in a worshipful, dynamic and congenial setting. Willingness to invest the time, dedication and commitment such an ensemble requires is needed. No audition is required, just a voice placement to allow the choirmaster to hear your voice independently. Rehearsals are Wednesday evenings from 7:00 to 9:00 pm and Sundays at 9:30 am. Some additional rehearsal time might be needed for special services such as those during Holy Week or Christmas. Trinity Choir sings for the 10:30 am Sunday service, except for the August summer break. The Choir prepares an anthem for the Offertory and the Eucharist based on the prescribed lessons. Anthems are drawn largely from the English cathedral repertoire, particularly the a capella music of the 17th and 18th centuries. Anyone interested in singing in Trinity Choir should contact the Church office at 713-528-4100 or use the form below.